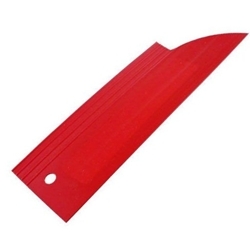 Like many installation tools in the window tinting industry, the Red Devil corner tool was not originally designed for window tint installation. However, many resourceful installers determined that this tool could be used to access very tight areas to lay down film. Also, many flat glass installers found that it makes a great trim guide tool as well. The Red Devil comes with an 8" long body and pointed tip design.